2017 is rapidly coming to a close. 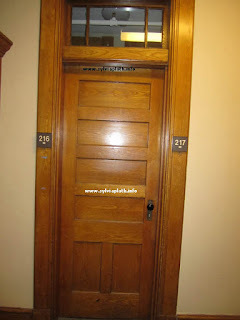 As of right now this is supposed to be the last Sylvia Plath Info Blogpost of the year. There was, it seems, a buzz about Sylvia Plath and 2017. Don't you think? 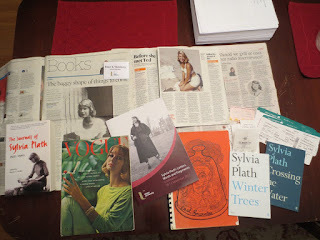 As with years passed, this blog posts looks seeks to review the year that was in Sylvia Plath. Largely from my perspective, which is limited admittedly, but I hope as always it refreshes our memories at what was undoubtedly a packed, memorable year. Sadly early in the year, Plath's friend Elizabeth Sigmund passed away. I began communicating with Elizabeth after a 2009 Guardian article ran on "Three Women" that I was interviewed for and she sought me out. We became good friends and I was thrilled to introduce her and Gail Crowther and they became even better friends. 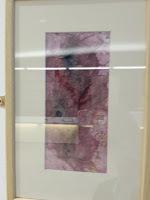 I had the pleasure of meeting Elizabeth and her husband William in person, with Gail, in March 2013 when presenting a paper at Plymouth University. Elizabeth was --and still is-- a lovely person. There may be more, but two other deaths that I know of are Plath's editor at Knopf Judith Jones, and former boyfriend Richard Sassoon. There were a few books to come out this year, you might have heard of them? 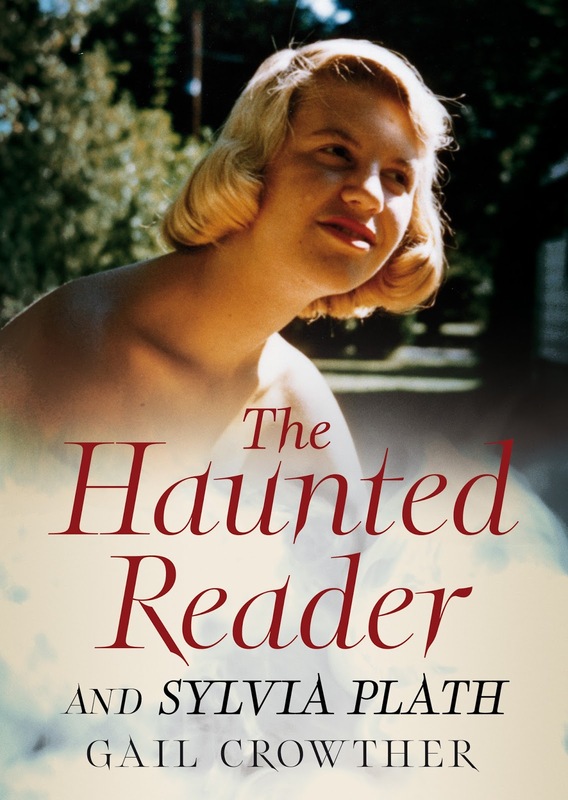 Gail Crowther got the year off on a great start with The Haunted Reader and Sylvia Plath was published by Fonthill on 10 February 2017. I was thrilled to conduct this interview with her. 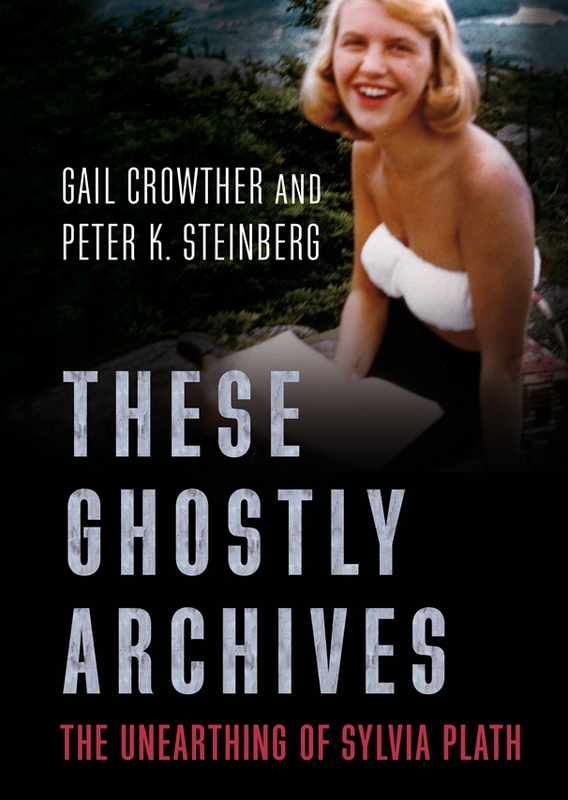 This was followed in May by the publication of These Ghostly Archives: The Unearthing of Sylvia Plath also published by Fonthill and co-authored by Gail Crowther and Peter K. Steinberg. 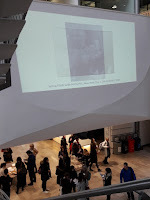 Danuta Kean at The Guardian broke a story about one of the findings that Gail and I discuss in the book about two lost poems that were found on a piece of carbon typing paper. 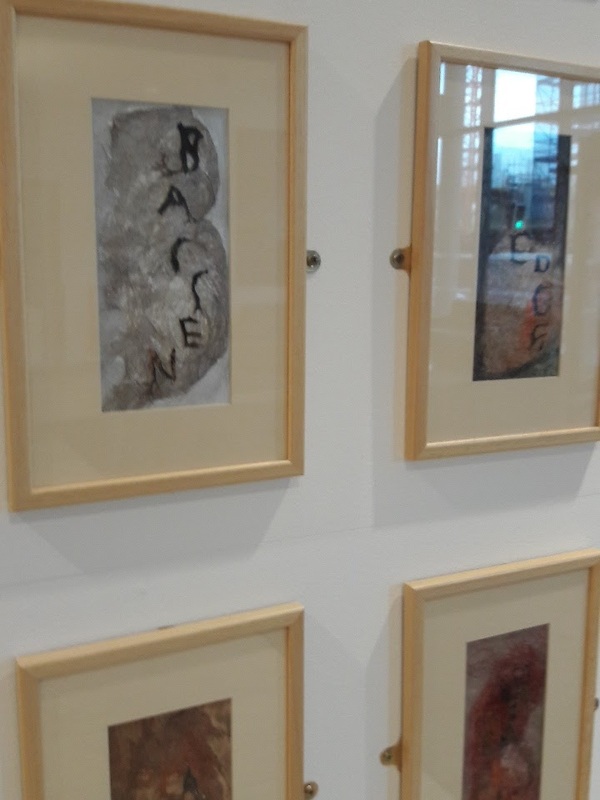 I was in New Zealand at the time on holiday (and proofing the Letters) so missed out on a chance to discuss this on various BBC programs but Gail did a spectacular job in my absence. Julia Gordon-Bramer published the first two books in her "Decoding Sylvia Plath" series which look at, respectively "Daddy" and "Lady Lazarus". Look for more from her in 2018. 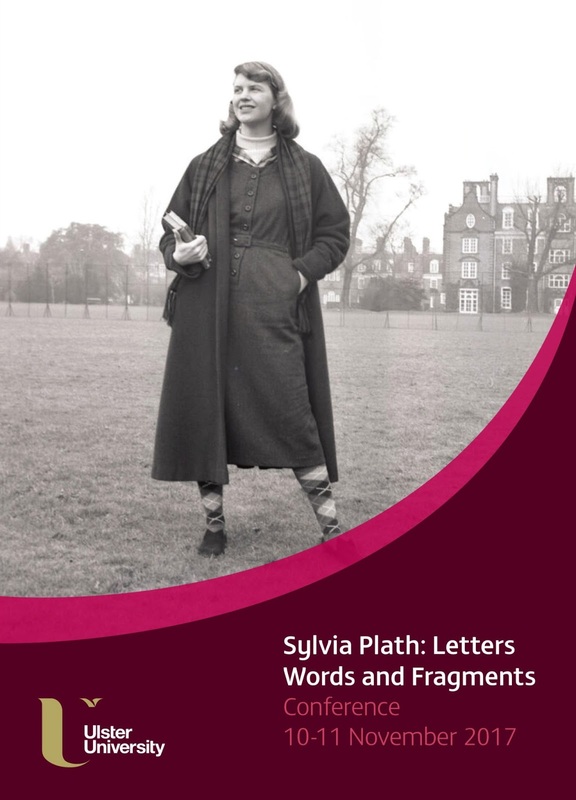 Zsófia Demjén published Sylvia Plath and the Language of Affective States: Written Discourse and the Experience of Depression with Bloomsbury. 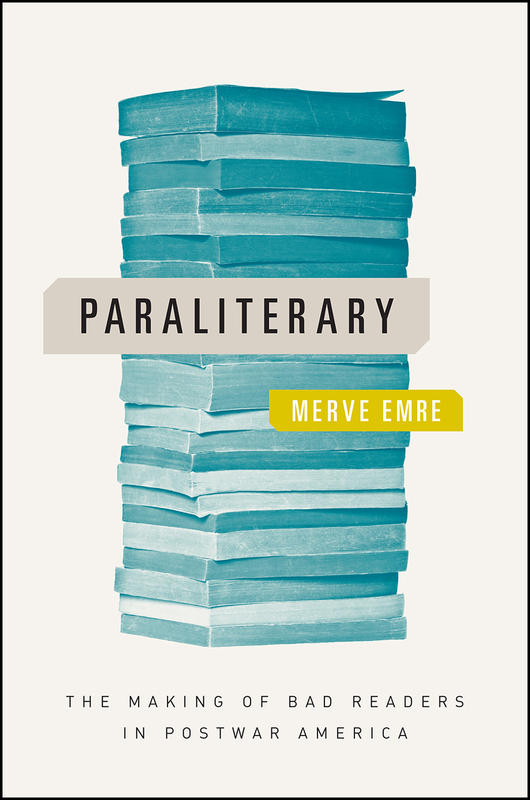 And in November, Merve Emre published Paraliterary: The Making of Bad Readers in Postwar America with University of Chicago Press. Plath features prominently in Chapter Two: "Reading as Feeling". 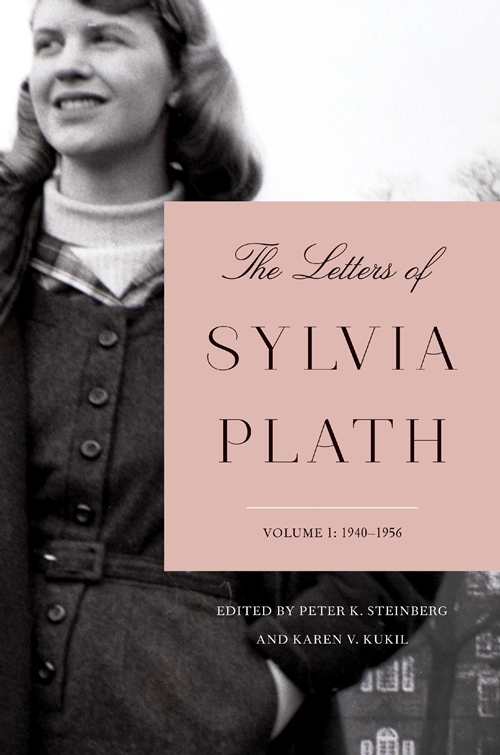 The biggest book by far, both in size and coverage, though was the long-awaited The Letters of Sylvia Plath, Volume 1: 1940-1956 edited by Peter K. Steinberg and Karen V. Kukil (Faber and Faber; HarperCollins). The book made a splash in England for the wrong reason but was otherwise reviewed in some big publications and England and America. A bibliography of these reviews can be seen on my website. It thrills me beyond expression to have these first 838 letters in your hands. (In conjunction with the letters, Faber reissued Crossing the Water and Winter Trees.) 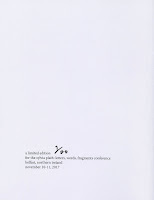 Volume 2 was delivered to the publisher on 27 October 2017. 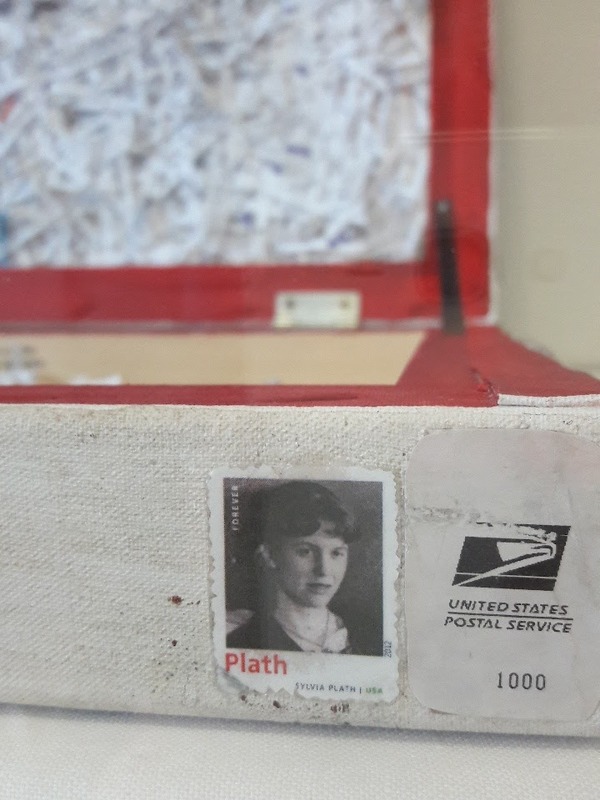 Speaking of letters, in March we learned that the archive of Harriet Rosenstein, a would-be but never-was Plath biographer, was for sale and included some highly sought after papers such as 14 letters written by Plath to Dr. Ruth Beuscher. This sparked some controversy as a result of Smith College opening a lawsuit against Rosenstein, which is still ongoing. 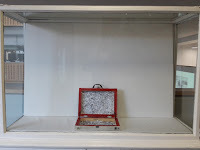 At the time of writing the letters are still unavailable to researchers. A lot of really bad information was printed in news stories that broke, the first one of which was by Danuta Kean of The Guardian. 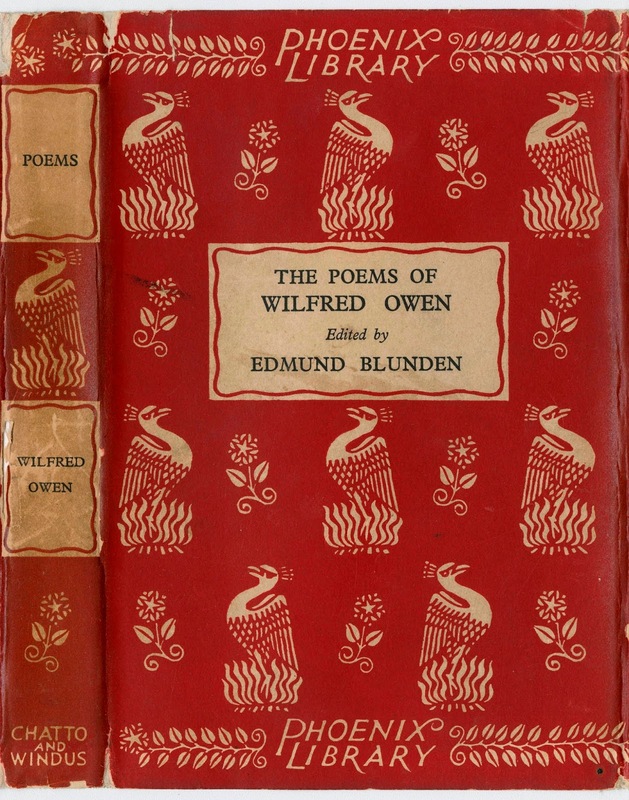 One happy result of this though was that as a result of this we got the 8 letters from Plath to Melvin Woody and we got them into the first volume just in the nick of time. And I mean, it was truly a stressful, photo finish. 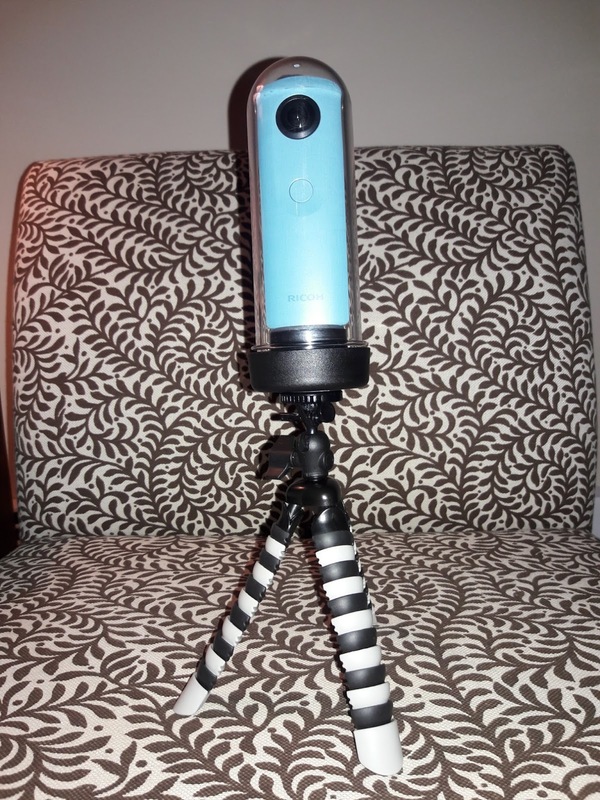 Let's look at some of the posts that appeared on this blog! In January the year got off to a good start, I think as I made some upgrades to my website for Sylvia Plath, A celebration, this is. The upgrade? I added article transcriptions of all the articles on Plath's first suicide attempt. I have always liked having transcriptions of materials, even for articles like this with a massive redundancy of information, because it means text is findable in a flash either on my computer or on the internet. January also had the only "Did you know…" for the year which is a long, rambling and I hope interesting post. There were five posts in particular that were a lot of fun to work on and had been on my mind to do for years. 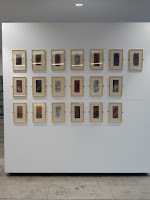 And all are from Plath mss II at the Lilly Library. 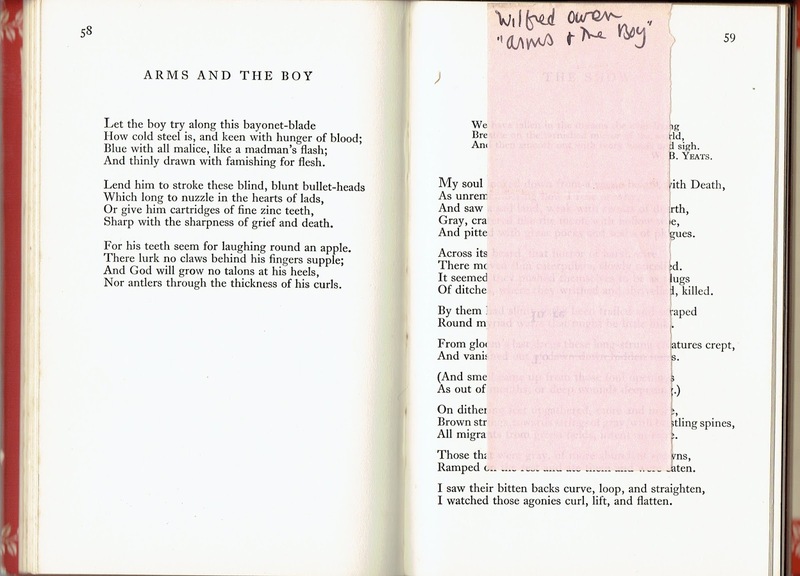 In March there were posts on the manuscripts of two Plath poetry collections. Circus in Three Rings was compiled in the spring of 1955 during her last semester at Smith College. 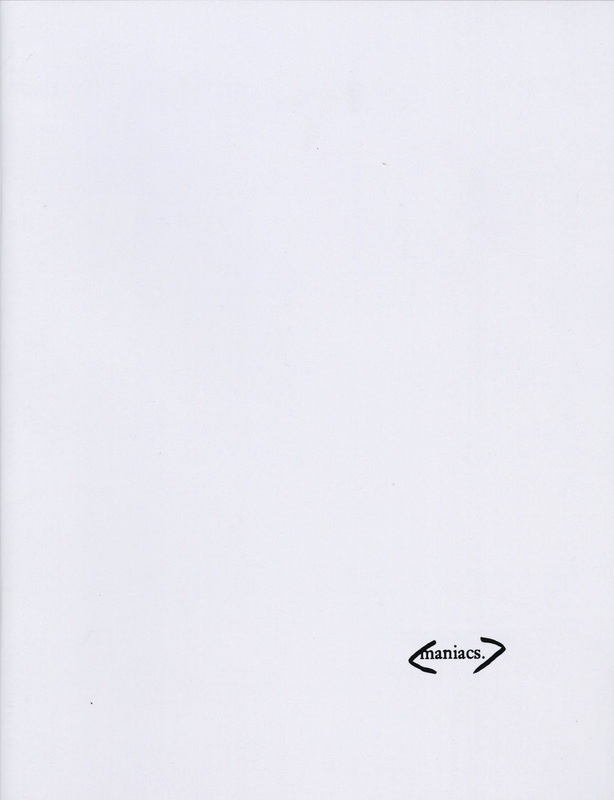 The Colossus was submitted to the Yale Series of Younger poets in February 1960. 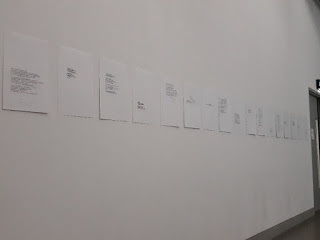 Working on these I dug deeply into the poems that were assembled and investigated their composition dates. 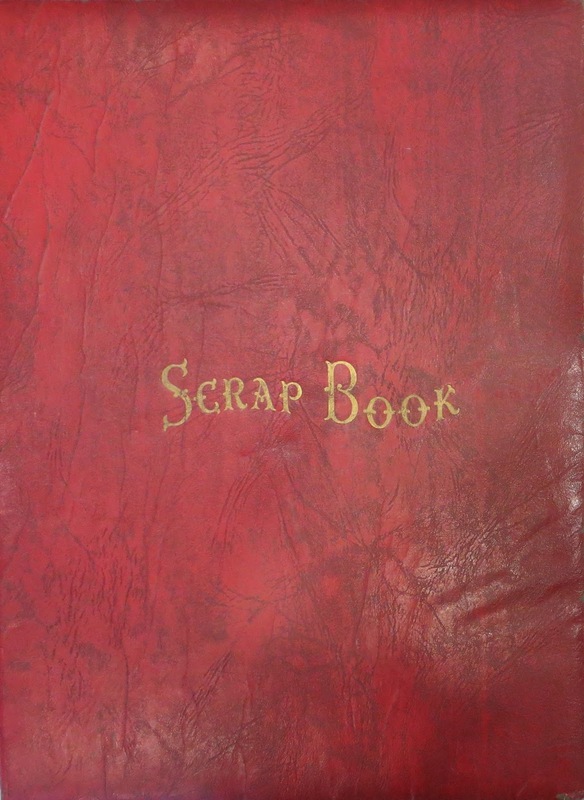 The other two posts looked at Plath's High School Scrapbook and her Smith College Scrapbook. 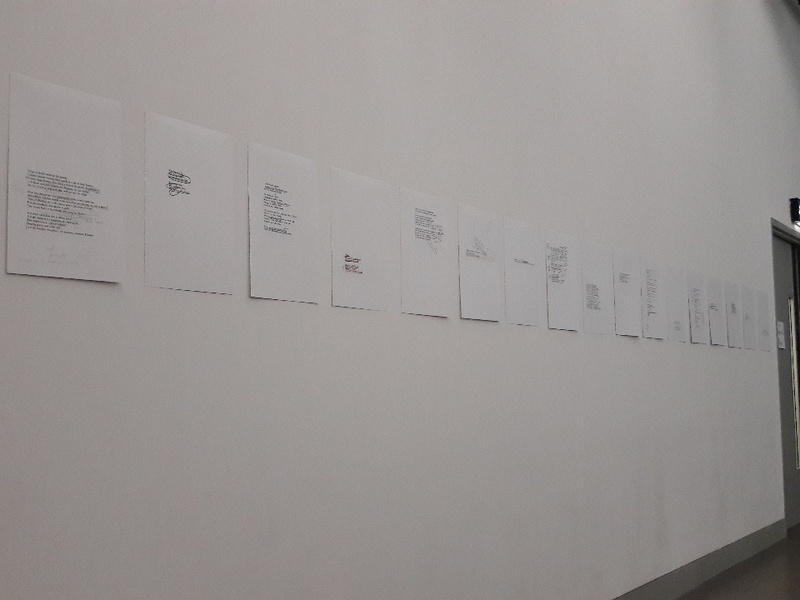 I had worked with these in March 2015 and spent some time over the next two years enjoying and transcribing them. 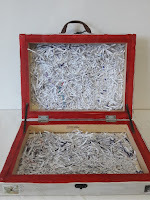 Look for an essay on Plath's scrapbooks, too, in Tracy Brain's forthcoming Sylvia Plath in Context. They are two of my most favorite Plath documents and getting to work with and on them so closely was a dream. 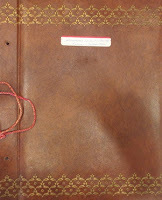 The fifth feature from the Lilly Library was a catalog of dates and places of photographs in the Lameyer mss. All of these things are of interest to me which is why I guess I spend so much time on them. I really hope you enjoy this kind of thing as well. 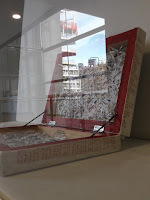 In August I started a series -- another long term thing I have been interested in and working on but the letters disrupted some opportunities for personal research and writing, not that I am complaining -- on The Education of Sylvia Plath. 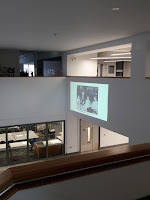 In this, I looked at the courses she was taking at Smith College and include, where possible, the papers or creative works that she composed: 1950-1951, 1951-1952, 1952-1953, 1954, and 1954-1955. Getting outside voices and opinions on any Sylvia Plath topic is always a good thing as it presents a different perspective here than mine (and it relieves me of some of the self-put-upon pressure to do new posts). Guest posts this year were by Gail Crowther on power and politics in the archive; Gesa Matthes on her film The Lady in the Book, Sylvia Plath Portraits; Sheila Hamilton on The Letters of Sylvia Plath, Volume 1, and Bella Biddle on two Sylvia Plath Conference panels. 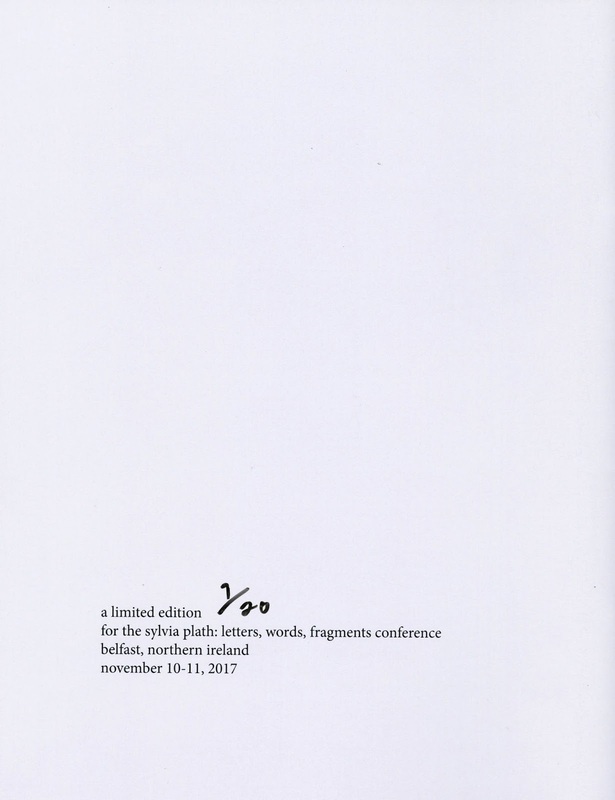 If The Letters was the biggest publication, the biggest event of the year was Maeve O'Brien's two-day conference Sylvia Plath: Letters, Words, and Fragments held at Ulster University in Belfast, Northern Ireland. Bringing together more than 50 Plath scholars from around the world, this was the fourth major international conference for Plath since 2002. 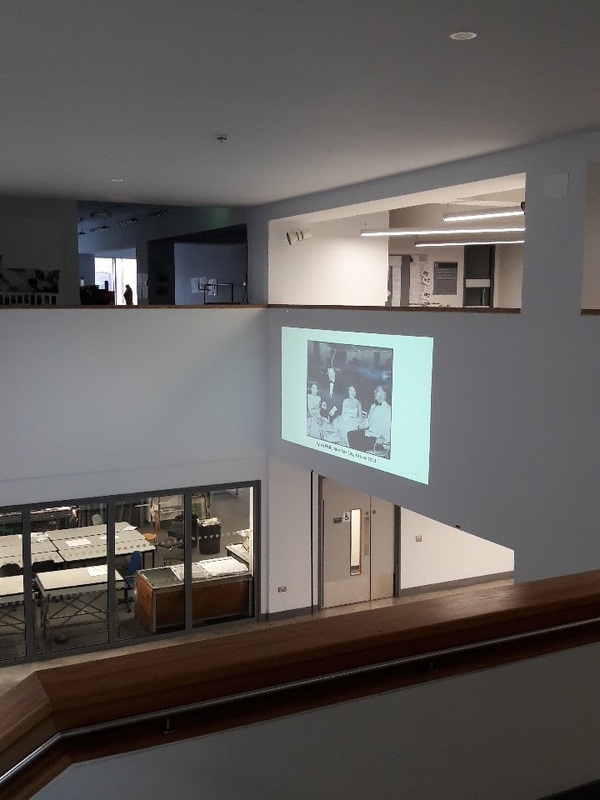 Day One was special as all the papers given were attended by each person; Day Two was structured with concurrent panels before Karen and I gave keynote talks. 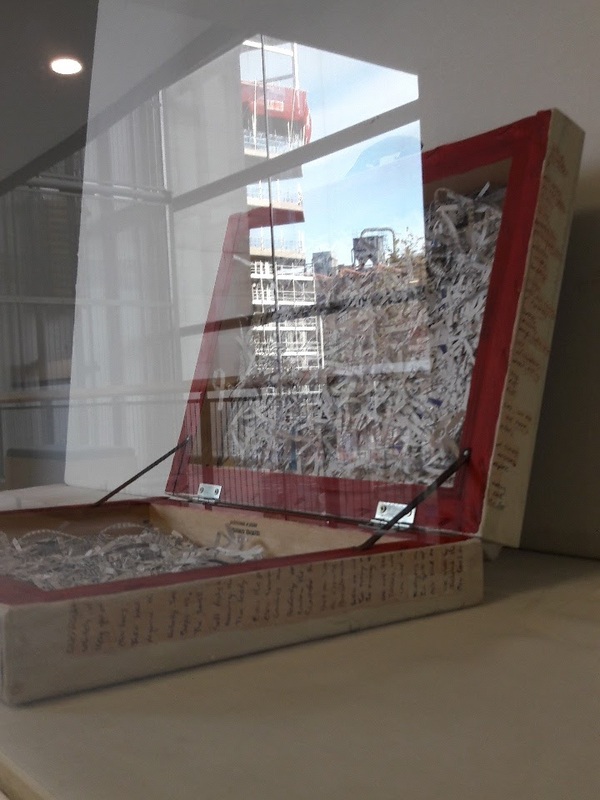 As with past conferences, there were some art exhibits on display, too, with contributions this time around from Christine Walde and Kristina Zimbakova. 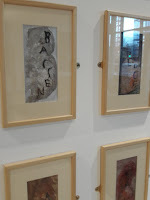 It was a warm, collegial event and I was so happy to see so many people had already made use of The Letters. It was fantastic, too, to see old friends and make many new acquaintances. Meeting someone in person that you've previously only emailed with or had contact through social media is a special thing. On a long layover in London I decided to escape the airport and walk around Primrose Hill. 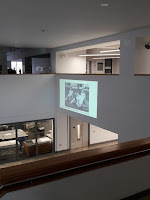 Joined by Nick and Kathrine Smart, we somehow stumbled into an unguided tour of Plath and Hughes's flat at 3 Chalcot Square. Needless to say, I had a happy flight home for sure. 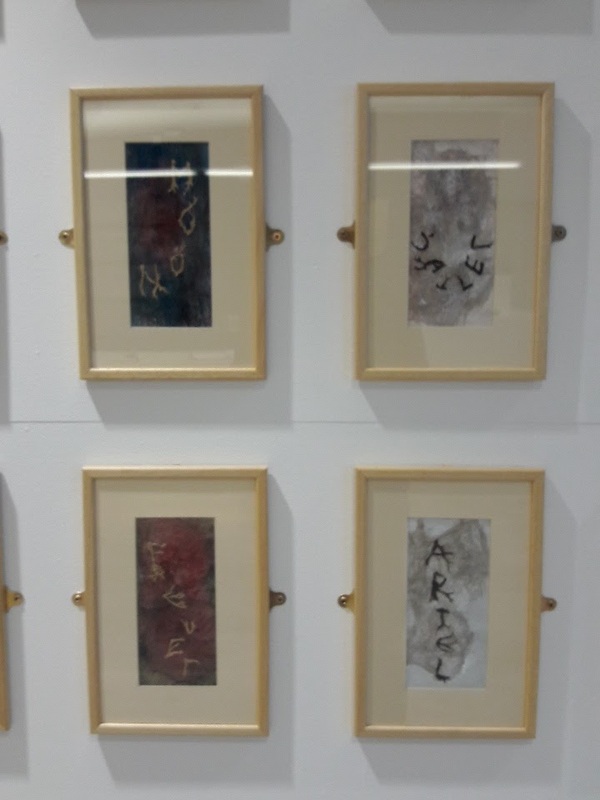 There were two exhibits on Plath this year, too. What a year 2017 was! I mean, seriously! 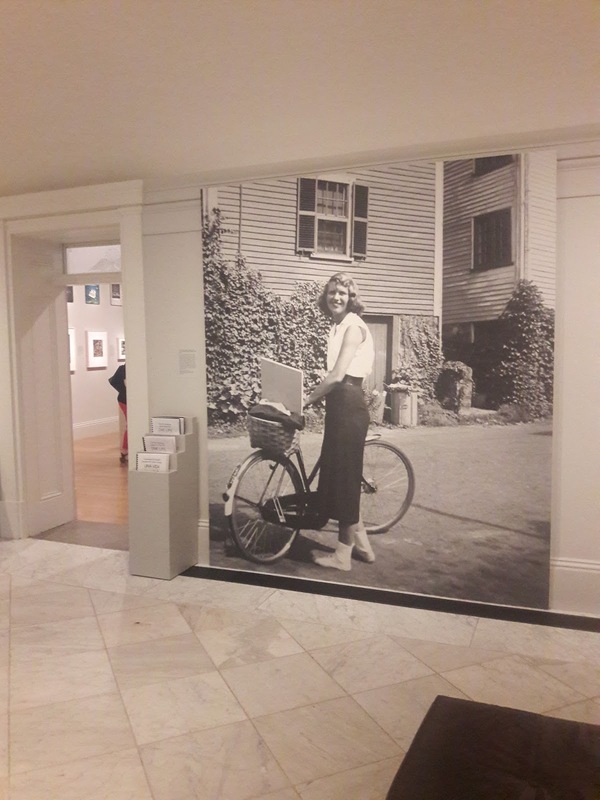 The One Life: Sylvia Plath exhibit opened in late June at the National Portrait Gallery in Washington, D.C. It's on for nearly a year, so please do try to see it. The exhibition marries pieces of Plath's archives from Smith College, the Lilly Library, and private collectors. Judith Raymo, a classmate of Plath's at Smith College, exhibited selections from her personal collection of Sylvia Plath books and manuscripts at the Grolier Club. In conjunction with the exhibit, Karen, Heather Clark, and I gave papers at a one day symposium. A look at the stats from the blog! From 1 December 2016 to 30 November 2017 the most popular pages on A celebration, this is were: Biography, Johnny Panic synopses, The Bell Jar, Publications, and Poetry Works. Like last year, let's look at duration. The pages that people spent the most time on were: The Bell Jar (4:54), Biography (4:39), Johnny Panic synopses (4:22), Works Index (2:58), and Publications (2:57). The total number of hits, combined, for blog and the website was 67,999 (page views is a higher number at: 106,459).This is the first year that blog hits exceeded those on the website. I do not know or understand why. However, pageviews were higher on the website. By country, most visitors to the blog come from the USA, followed by the UK, Canada, Australia, and The Netherlands. For the website, it is slightly different: USA, UK, India, Russia, and Canada. All year long I have been doing a random "Sylvia Plath read" each day and posting it under the hashtag #VitaminP. This has been a lot of fun, though a couple of days I forgot to include the hashtag (this was pre-280 characters for sure) and I did miss posting one day here and there, though I did do a reading. I know of at least one person who has been doing their own daily Sylvia Plath read, which is exciting. I might try to keep it up into 2018. It gets me reading something by Plath each day, and has started some conversations too. So if I do keep it up, please pardon any duplicates. Or triplicates. Or more! I could read "The Night Dances" every day and be sustained. To top it off, I had three pieces published this year as well. 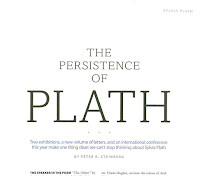 In September, the lovely magazine Fine Books & Collections printed "The Persistence of Plath". 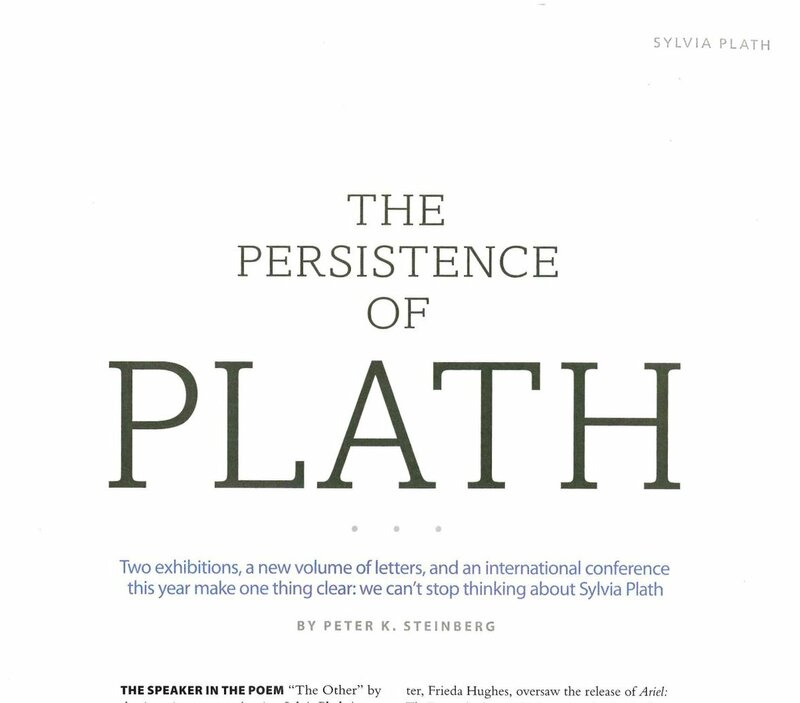 This article discussed two exhibits (One Life: Sylvia Plath and Judith Raymo's) and The Letters of Sylvia Plath. In October Faber published a short piece I wrote on their blog about some of the work that went into the editing of the letters. Also in October, the journal Court Green re-launched and I was thrilled to see a piece I wrote included: "A Fetish Somehow": A Sylvia Plath Bookmark. Sorry to bombard you all with Plath!! Maybe I will take a year off sometime! 2018 should see us all getting closer, day-by-day, to Heather Clark's highly anticipated new biography of Plath (which I think is scheduled for 2019). 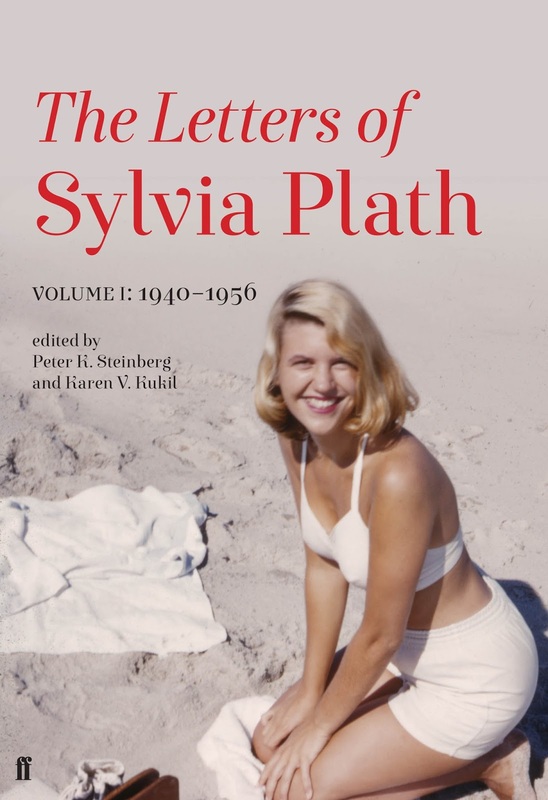 And, of course, The Letters of Sylvia Plath, Volume 2: 1956-1963 is coming out… Right now publication date for the Faber edition is set for 6 September 2018, and we should see the first proof in January! How exciting! 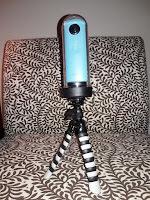 Look for updates here or on Twitter as and when I get them (and can share the information). 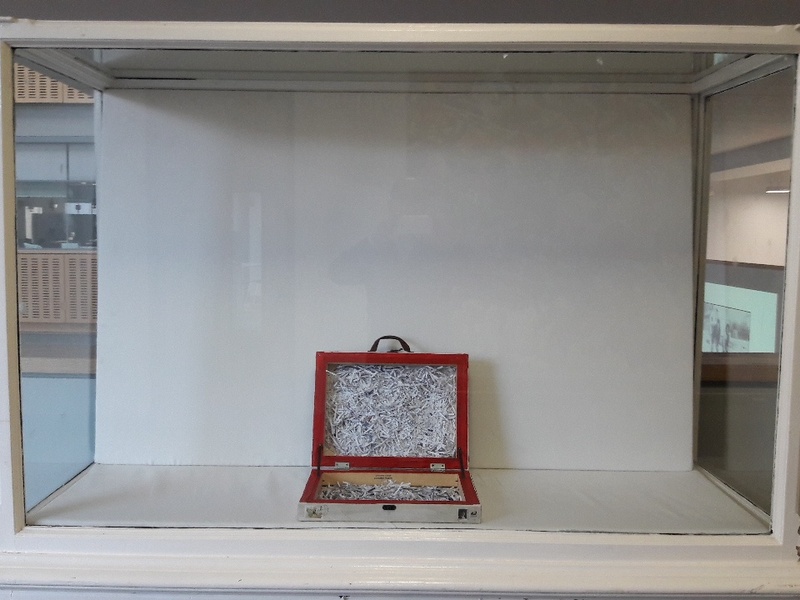 Long-term visitors to this blog will recognize that since 2013 there has been a massive drop off in posts and that was in large part due to work being doing on The Letters of Sylvia Plath. You have all been incredibly patient and supportive during that project; and thank you all for sticking with me and the blog for the duration. 2017 was the tenth anniversary of the Sylvia Plath Info Blog! And 2018 will be the twentieth anniversary of A celebration, this is. It is really, really hard for me to think that this is true, that it is possible for me to have been at it this long. But it is. Thank you all very, very, very much for all your emails, comments, tweets, and even phone calls. Thank you! Happy end of the year to you. Safe travels, happy reading. All linked accessed 15-16, 22 November and 13 and 21 December 2017. So, I hope many of you are giving or receiving, as gifts, copies of The Letters of Sylvia Plath, Volume 1: 1940-1956 and These Ghostly Archives: The Unearthing of Sylvia Plath. 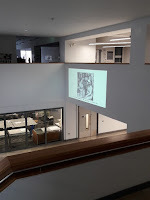 The first one is a July 1961 copy of Vogue, the British edition as it had an article in it I wanted to see by John Wain and featured a photograph of Ted Hughes taken by David Bailey. The article mentions the Poetry at the Mermaid Festival event but does not mention Plath. The above and this item were gifts to myself. The second thing that I had sent to her was a somewhat rare copy of Trevor Thomas's 1989 self-published memoir Sylvia Plath: Last Encounters. There are two copies for sale right now on ABE books for, respectively, $659 and $902. 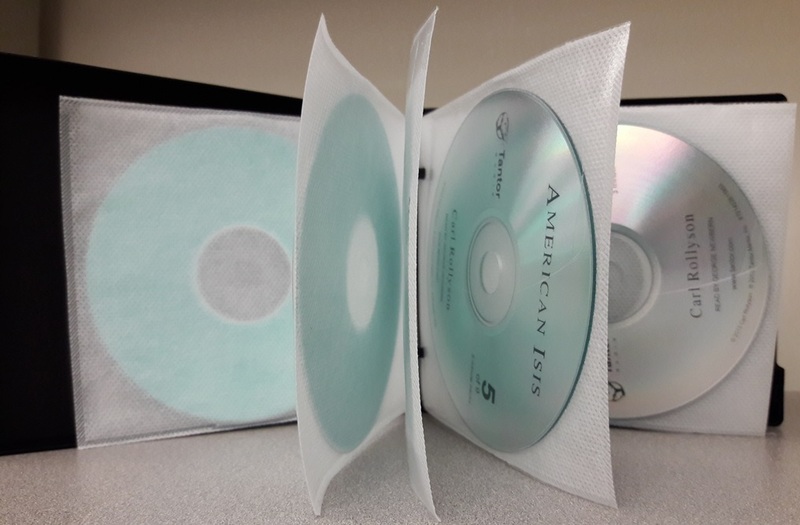 These appear to be in really nice condition. The copy I got is anything but and as such was a fraction of the cost at about $60. The cover is completely mangled and in fact at some point it was trimmed and affixed to the first page by scotch tape which is so awful a thing to have done. The first page, too, is loose from the plastic spiral comb binding. Would I have liked a pristine copy? Yes, but that's well outside of my price range and this copy is readable and otherwise complete. There are copies available at a number of archives for those who may be interested in reading it. I hope to read it again (it has been years) sometime in 2018. A couple of gifts recently arrived for me in the mail that I would like to acknowledge. I have been advised another gift is in on the way, so look forward to a post on that in 2018. First up from the author himself is the audiobook version of Carl Rollyson's 2013 biography American Isis: The Life and Art of Sylvia Plath. The book is read by George Newbern and is unabridged. I have never listened to an audiobook before but will give this a "read". Thank you Carl. 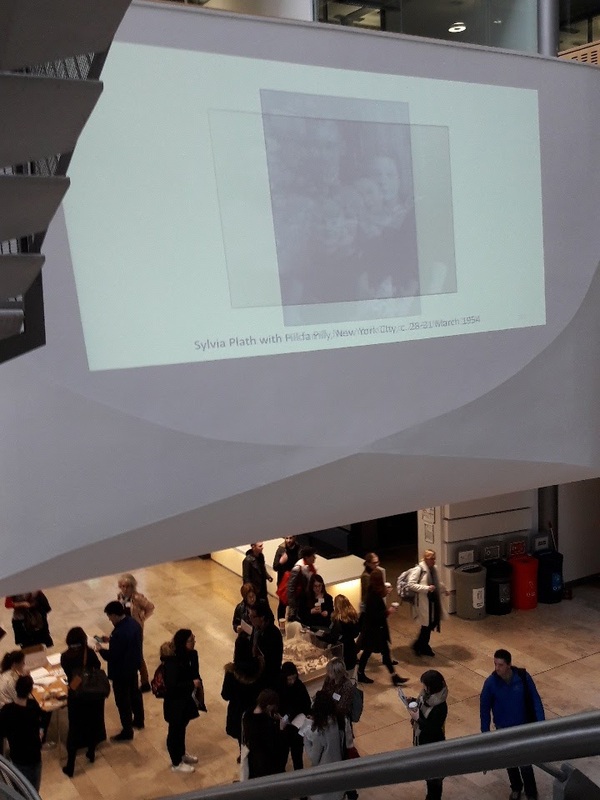 At the Belfast Plath conference, one of the more interesting panels was Saturday's "Teaching and Learning in Sylvia Plath Studies and Women’s Studies: Community Engagement, Digital Humanities, and Service Learning". The panelists were Dr. Julie Goodspeed-Chadwick (Indiana University-Purdue University Columbus), Bailey Burnett (Ball State University), Brandi Rund (Indiana University and Indiana University-Purdue University Columbus), and Courtney Watkins (Indiana University-Purdue University Columbus); and it was moderated by Dr. Amanda Golden. 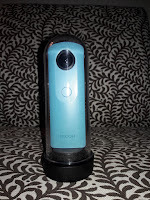 Brandi showed off a wicked awesome Ricoh Theta 360 degree view camera which absolutely blew me away. During her portion of the panel, Brandi exhibited the functionality and coolness of the camera with this panel and spectator photograph. How cool is that? 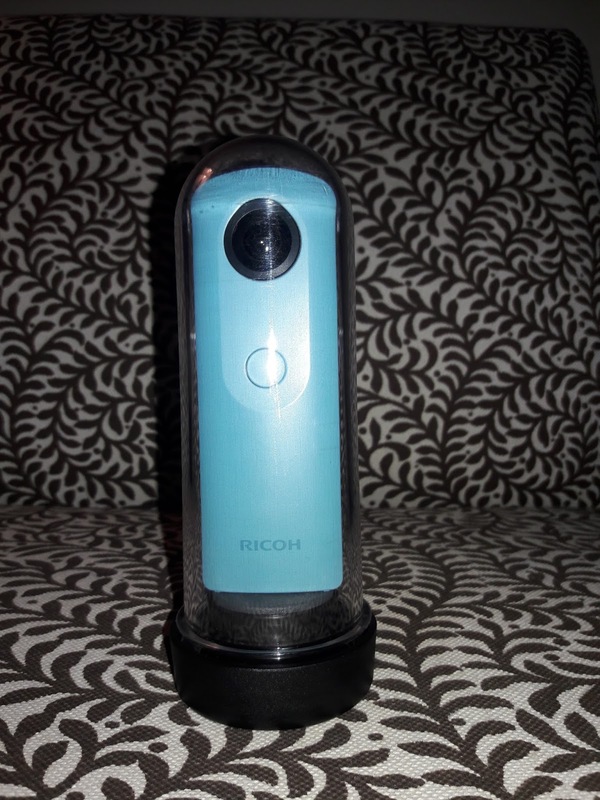 Well, Brandi did just about THE nicest thing of all time and sent me my own beautiful blue Ricoh Theta SC. 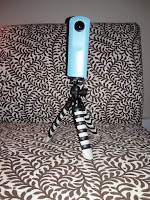 With the camera, Brandi sent a neat tripod and hardcase, which is a clear plastic tube, which I am calling a bell jar, to protect the camera in the elements. 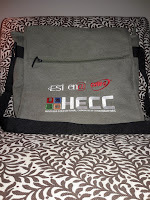 And a bag from the Hoosier Educational Computer Coordinators conference. 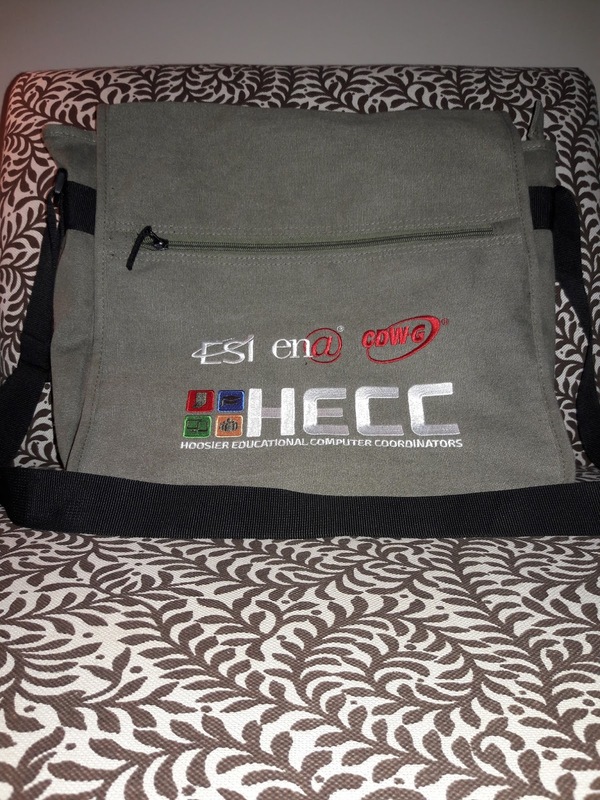 I've been needing a new shoulder bag and this one is really nice. Her gesture has floored me. 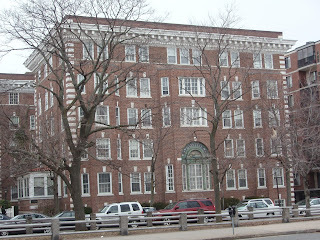 The other day I went for a run at lunch and took some photographs of Willow Street in Boston: it's intersection with Mt. Vernon Street; Acorn Street, and Chestnut Street. On the way back, I ran through Boston Common and the Public Gardens. It had snowed two days before so it was all rather bright and lovely. Lastly, here is my little library. 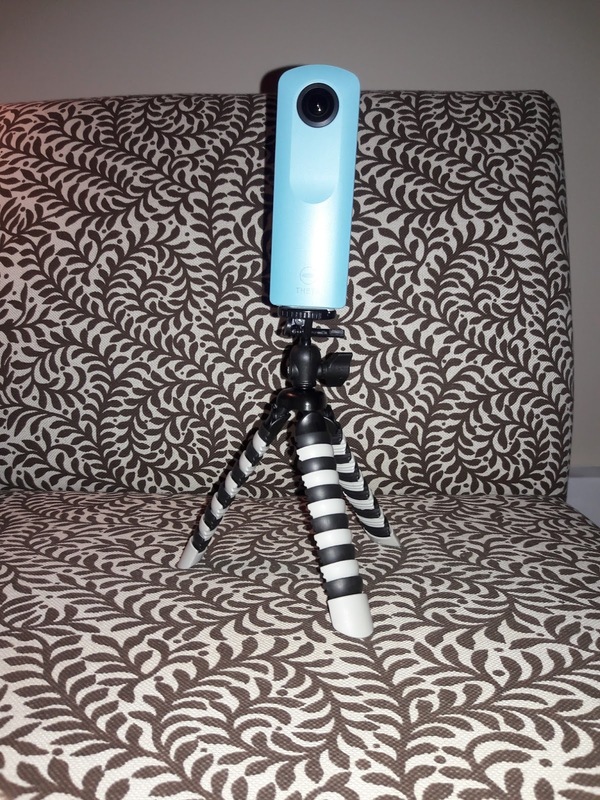 The camera is particularly neat and sweet as regardless of whether or not you are connected to WiFi, the camera and phone create their own network (or something) and you can take the photograph using the app on your phone. I hope at some point this winter to record some more Plath sites in and around Boston, as well as maybe Smith College if I can get out there. Brandi, thank you for the bottom of my increasingly bitter and shrived curmudgeonly black heart. Gail, Carl, and Brandi: you are all so kind to me and I am trying to figure out what I ever did to deserve such treatment. Thank you thank you thank you very much for your gifts which will all be cherished (I promise to eat only the chocolates). All links accessed 7-11 December 2018. 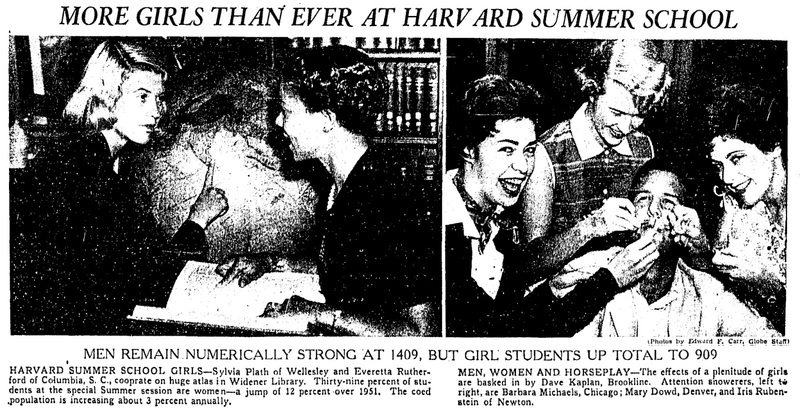 Sylvia Plath's final year at Smith College was tremendously successful. She lived in Lawrence House "with" Nancy Hunter (later Steiner) in what was then room 4 on the second floor (present day room number 217). 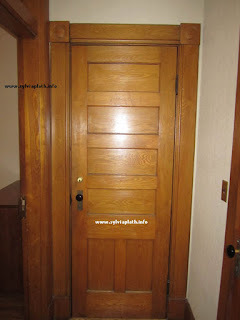 Walking into the room from the main door, one is presented with a vestibule like area. On each end is a closet and there are two separate, small rooms for the residents. 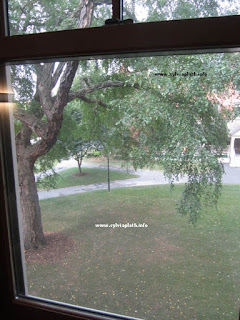 The windows overlooked a small tree-filled, green lawn and visit is Green Street. 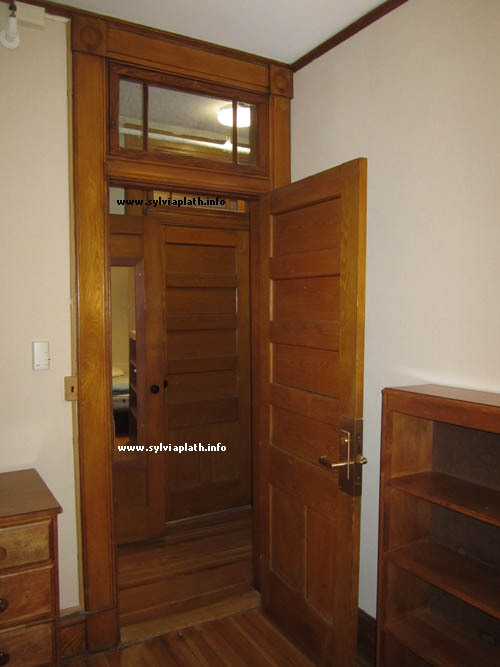 You can read more about this room in These Ghostly Archives: The Unearthing of Sylvia Plath by Gail Crowther and myself. 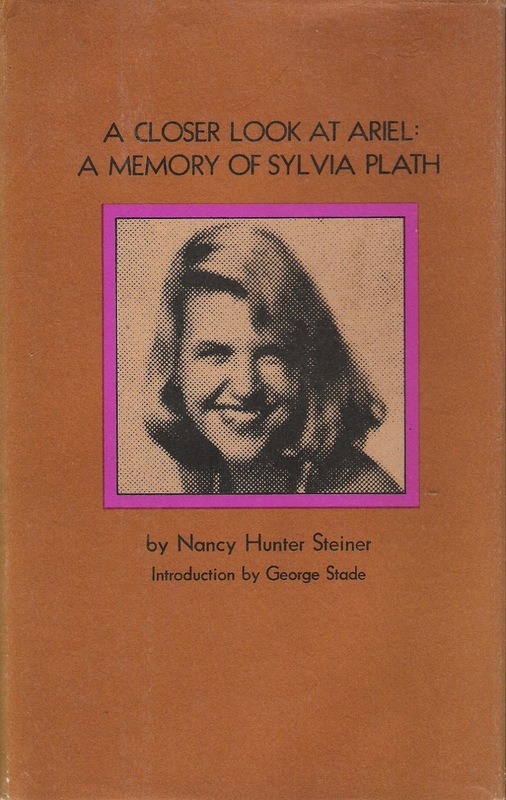 And you can read more about Plath's time at Harvard Summer School and her relationship with Nancy Hunter Steiner in Steiner's A Closer Look at Ariel: A Memory of Sylvia Plath (Harper's Magazine Press, 1973; Faber and Faber 1974). Plath strung Gordon Lameyer along as her main boyfriend, but by the end of the semester she was fully involved with Richard Sassoon, who remained her most significant other for the rest of her undergraduate months. 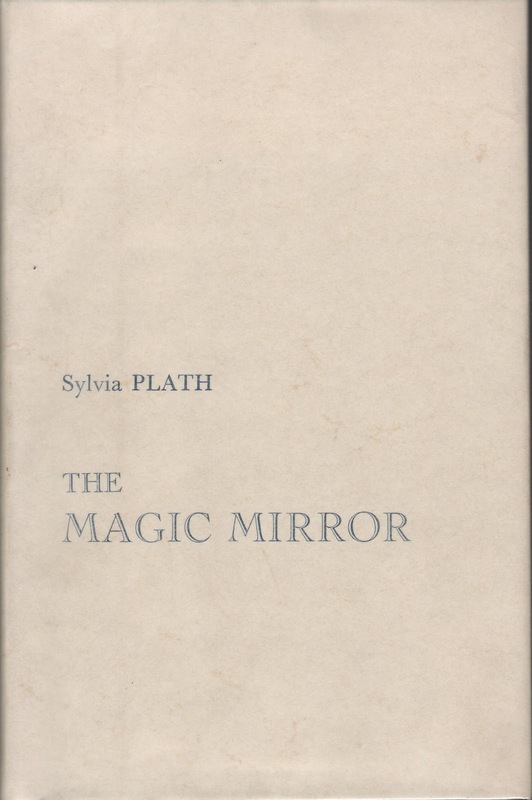 Plath applied for a Fulbright scholarship and other advanced degree programs, and completed her thesis, "The Magic Mirror; A Study of the Double in Two of Dostoevsky's Novels". Plath's two creative writing courses (Short Story Writing and a special studies in poetics) saw her create remarkable number of works. 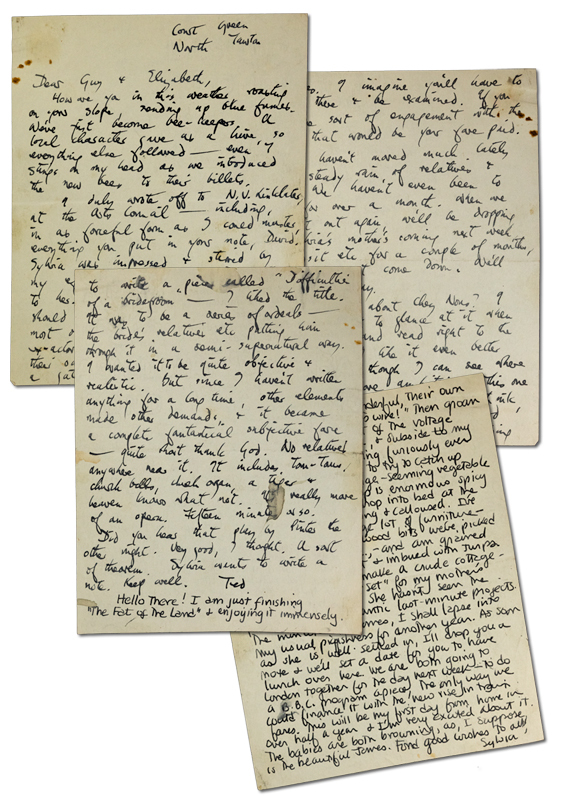 Plath's working papers for her thesis are held in Plath mss II by the Lilly Library. Her notebooks for Shakespeare and 20th Century American Novel (Modern American Literature) are also held by the Lilly Library. Many more details about aspects of Plath's final year are, of course, now available in The Letters of Sylvia Plath, Volume 1: 1940-1956. English 36, Shakespeare: A study of Shakespeare's dramatic development against the background of Elizabethan ideas, social, critical, and theatrical. Not open to students who have taken 37 with which this course alternates. Th F S 12. Esther Cloudman Dunn. 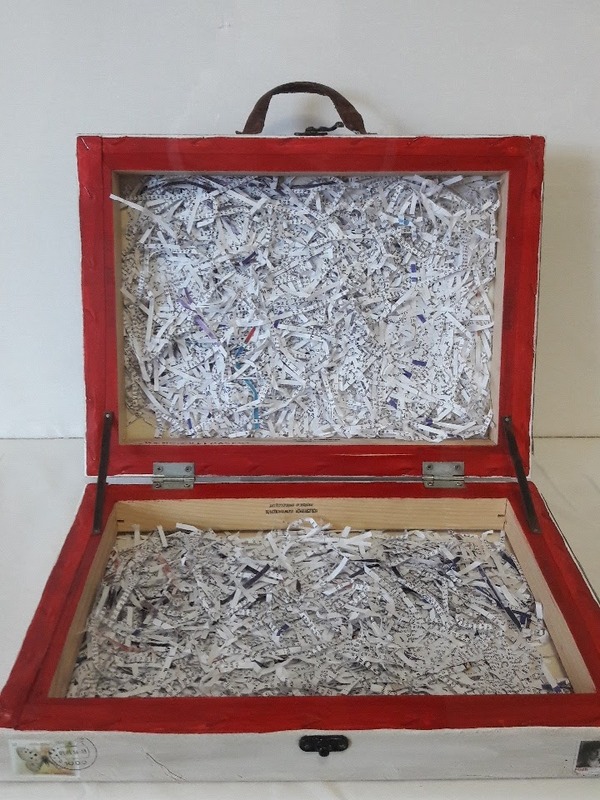 English 347a, Short Story Writing: Though the emphasis in this course will be on fiction, opportunity will be given for other kinds of writing. By permission of the instructor. W Th F 2. Alfred Kazin, first semester. English 417b, 20th Century American Novel: The Twentieth Century American Novel. Th F S 10. Alfred Kazin. "The Magic Mirror: A Study of the Double in Two of Dostoevsky's Novels; submitted 15 January 1955"
Intermediate Course. Prerequisite, two units in German or 11. M T W 11, Th F S 11, two additional hours to be arranged for conversation in place of some preparation. Anita Luria Ascher, Helene Sommerfeld. 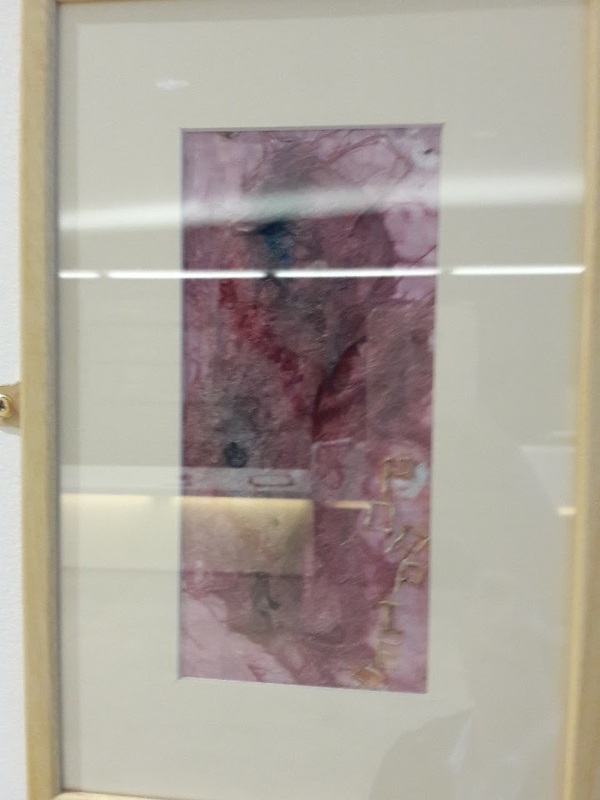 In 1989, Plath's thesis was printed in a limited edition (Rhiwargor, Llanwddyn, Powys [Wales]: Embers Handpress). WorldCat lists 28 copies that are available to read in libraries and archives. See the other posts in the Education of Sylvia Plath series: 1950-1951; 1951-1952; 1952-1953; and 1954. All links accessed 1 and 6 December 2017. 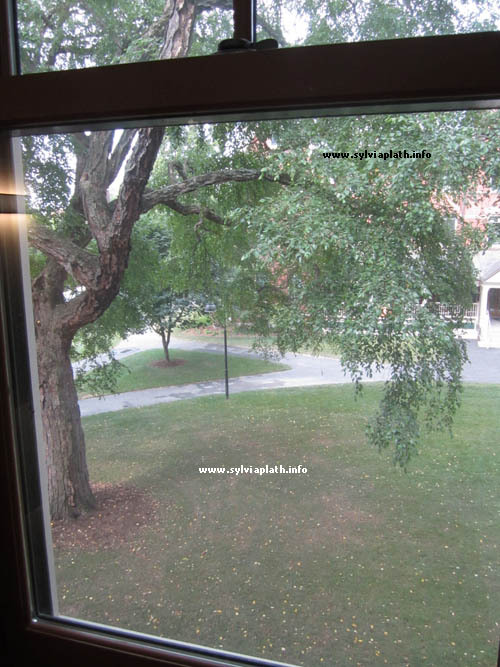 This post looks at the Education of Sylvia Plath for the spring semester, 1954, and at the courses she took at Harvard Summer School, 1954. 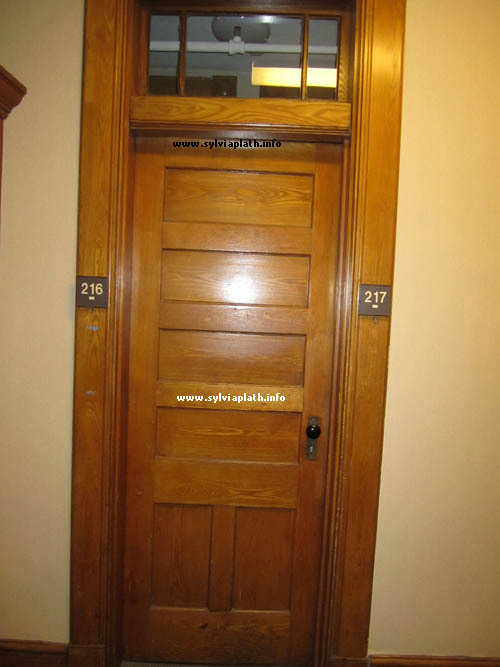 Sylvia Plath returned to Smith College for the second semester of the 1953-1954 academic year. 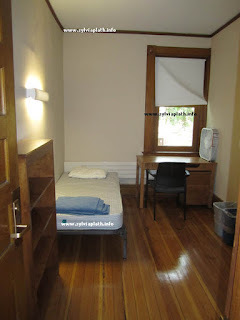 She resumed living in Lawrence House and during the spring had her own room (it was the same room she lived in the previous year, 1952-1953, but she had no roommate). It is unknown what courses Plath had signed up to take when decisions were made in the spring of 1953. It might be that the courses she took in the Spring of 1954 were among them; but it might also be that she was experimental. English 321b, American Fiction 1830-1900: Hawthorne, Poe, Melville, and James. M T W 9. Newton Arvin. Russian 35b,Tolstoy and Dostoevsky: M T W 12. George Gibian. History 38b, Intellectual History of Europe in the Nineteenth Century: Main trends of thought in their relation to the political, social, and economic background. M T W 11. Elisabeth Koffka. English 417b, The Twentieth Century American Novel: Th F S 10. Robert Gorham Davis. Plath attended Harvard Summer School in July and August 1954 and sublet an apartment at 1572 Massachusetts Avenue, Cambridge, Mass., with three other girls. I do not believe there are notebooks for these courses, or papers. There are no known journals for this time period, either. However, the summer was recorded meticulously by Plath in a pocket calendar and in review in her Smith College scrapbook, both held in Plath mss II by the Lilly Library at Indiana University. The only course Plath officially took at Harvard Summer School was German S-Bab (=11). German S-Bab. Elementary German: Aural-Oral Approach. Full course (8 units). 8-9 and 11-12 a.m.
For students who have had no German. Although attention is devoted to speaking and understanding the spoken language, the emphasis is on developing skill in reading. All students planning to enroll in this course who have studied the language previously are required to take the Placement Test given before the beginning of the course. Dr. James M. Hawkes, Groton School; and others. 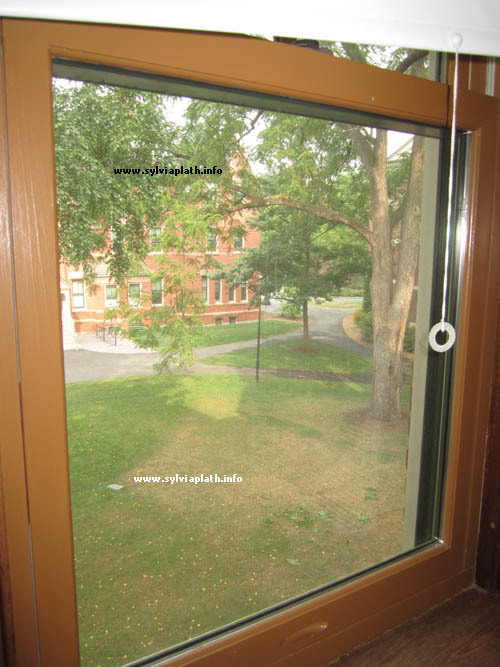 Harvard and Radcliffe degree candidates cannot count German S-Bab in addition to German A, B, or the first half of BC. Information above taken from Summer School Catalogue course description (HU 75.25, 1954-55, p. 78). The Harvard University Archives also holds the Final Exam (HUE 554.4) for this course. However, she also sat in on classes for a course in the Nineteenth Century Novel. Half-course (4 units). 12-1 p.m. 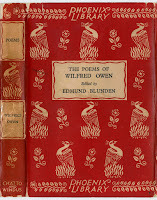 The nineteenth-century novel considered as the characteristic art of the European middle classes. Among the writers to be studied are Jane Austen, Stendhal, Balzac, Dickens, Flaubert, Turgenev, Tolstoy, and Trollope. Harvard and Radcliffe candidates cannot count English S-151 in addition to English 151. Information above taken from Summer School Catalogue course description (HU 75.25, 1954-55, p. 68). The Harvard University Archives also holds the Reading List (Call number HUE 83.554.6) and Final Exam (HUE 554.4) for this course. 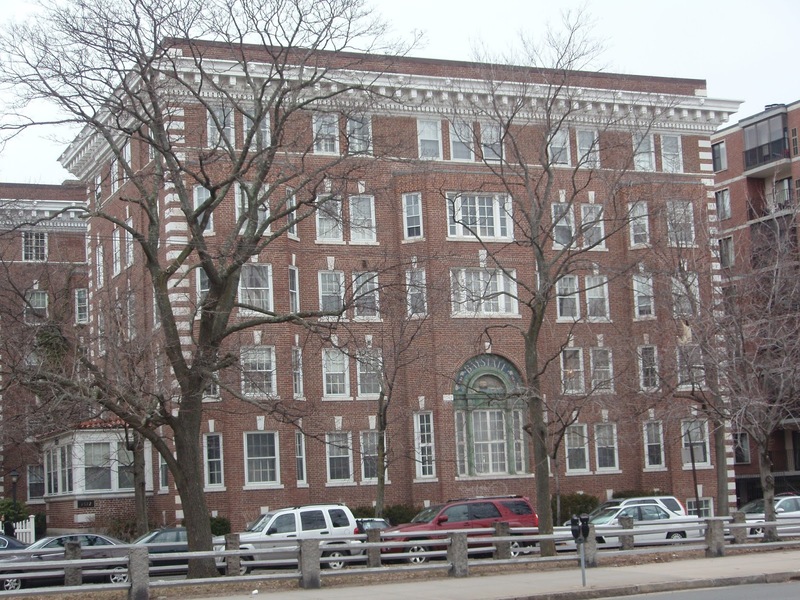 Plath took advantage of her situation in Cambridge with easy access to all of Harvard, Boston, and made frequent visits home to Wellesley. Plath also visited north shore Massachusetts beaches, Cape Cod, Newport, Rhode Island, and New Hampshire. On 24 July 1954, Plath went to Chatham with Gordon Lameyer who took the now very famous color photographs of Plath in her "a neat two-piece white Jantzen bathing suit" (Letters of Sylvia Plath, p. 314). One such photo resplendently graces the recently published Faber edition of volume 1 of Plath's letters. Sylvia Plath in full color, both inside and out. Two days later, on Monday 26 July 1954, Plath was photographed in Widener Library by the Boston Globe. 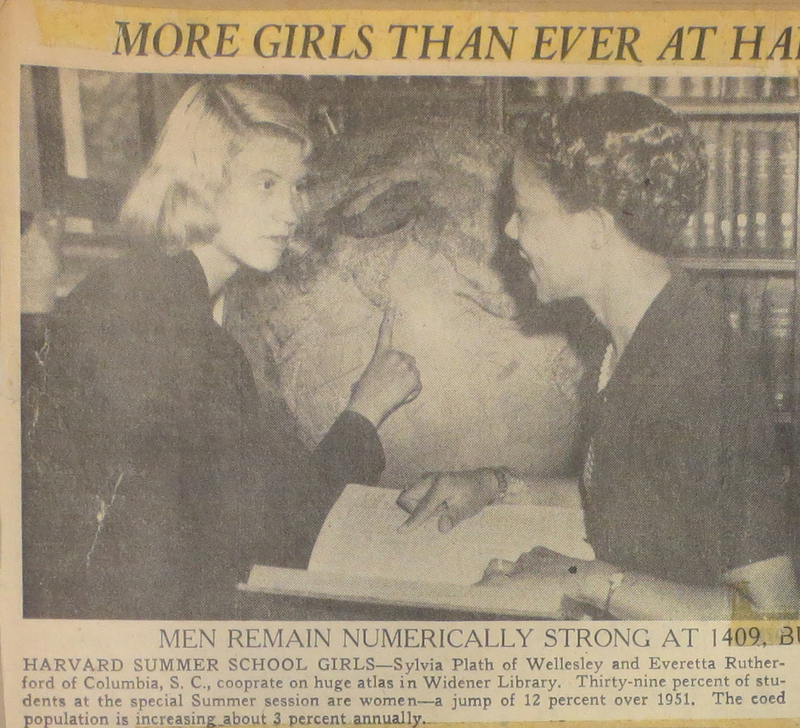 The photograph appeared the following day under the article titled "More Girls Than Ever At Harvard Summer School". 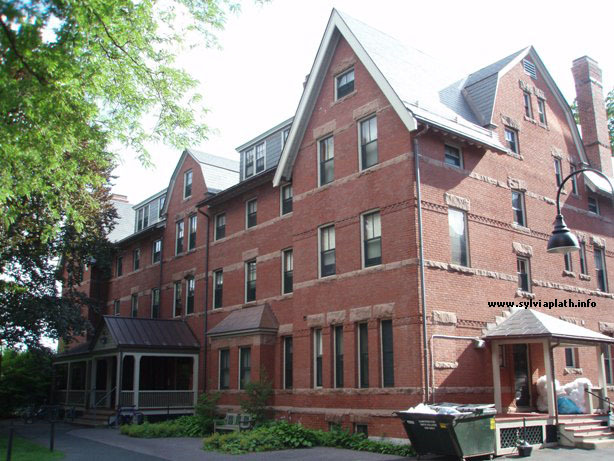 You can read a little more about some of Plath's experiences at Harvard School School in this post. 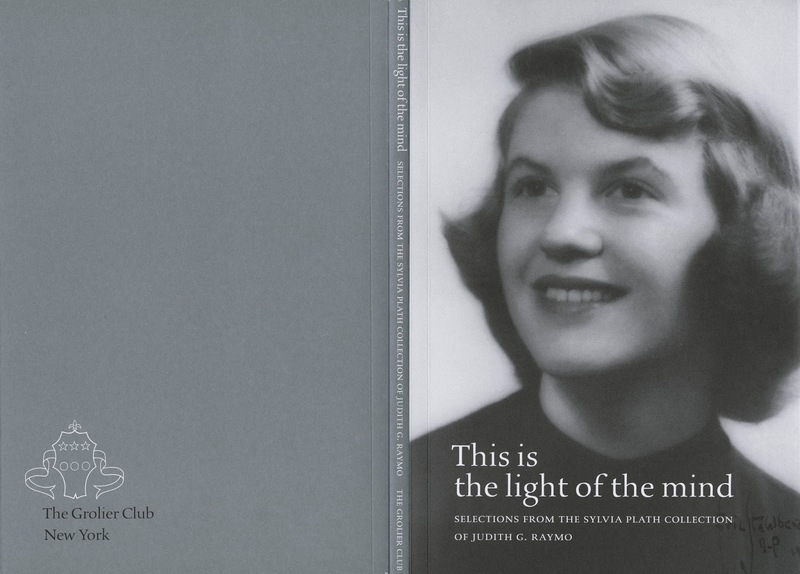 See the other posts in the Education of Sylvia Plath series: 1950-1951; 1951-1952; 1952-1953; and 1954-1955. All links accessed 1 October and 1, 7 December 2017.